Shri Adi Shakti our beloved Param Pujya Shri Mataji, The Parbrhma, The only one who is Sakar in HER Nirakar form, blessed HER devotees and children with Param Chaitanya, fulfilling the prayers and desire of yogis of Navi Mumbai, the land of Maya, The abode of Shri Mumba devi and Shri Mahalaxmi . 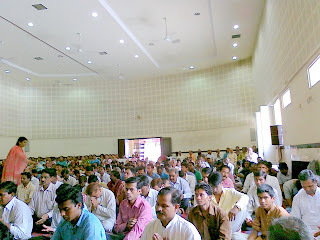 On 18th September 2011 a Sahaja Yoga meditation workshop- 'Festival of Meditation' was held at Ghelot Hall, Near I.G. 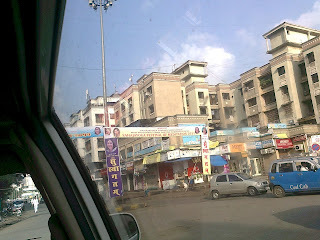 Engineering College, Koperkhairne, Navi Mumbai, Vashi. This program was organised by the devoted children and yogis of Navi Mumbai with a collective sincere desire of experiencing absolute oneness with Shri Mataji - the beautiful blissful state of Thoughtlessness- Nirvicharita- HER unique miraculous blessing to the mankind. The beautiful pure desire of yogis of Navi Mumbai was actualised by Shri Mataji by making the program organised with an invisible, most powerful, silent Divine power that the two and half storied air conditioned , Ghelot Hall was packed to its capacity with more than 1400 persons. On the ground floor of the Hall people sat on floor covered with carpet, balcony was especially arranged with chairs for the people who could not sit on floor and the first floor was available to people who had small children with them and needed little play area for their children.It was all done with love for the collectivity for the Navi Mumbai, workshop. No money contribution was collected from anyone to participate in this Mother's programme. Even Lunch, Dinner and Tea was arranged for everyone. This was the most loving and pure desire of the yogis of Navi Mumbai that as many children of Shri Adi Shakti as possible, could feel the practical experience of Meditating in front of our beloved Mother and feel HER miraculous presence on our being. This joyous moment set the witnessing of the 'Festival of Meditation' to be started with the Divine's permission in HER gracious presence. Pre Lunch session was an experience by every individual to feel the flow of vibrations and state of thoughtlessness as soon as one humbly sits before the enlightened photograph of the Mother and pray to HER to grant Thoughtlessness. It was emphasised that mostly instead of praying to Mother and keeping our attention towards HER we make the mistake of mechanically getting involved in various techniques and our thought process keep going on. How easily in a very Sahaja way Mother's miraculous powers makes us Nirvichar-was practically observed by all as prayer were offered to Mother through bhajans sung in HER praise followed by various Audio Clips about Thoughtlessness and the importance of HER name and Photograph. Lunch break was taken around 2 PM and post lunch session began with clearance of Chakras and Nadis by offering prayers to Holy Mother on every Chakra, Nadis and subtle system accompanied by singing soul touching Sahaja Bhajans offered to different deities of various Chakras to please our Holy Mother who is the Master-'Swamini' of all the chakras. It was a realistic experience for people to witness and feel that without any efforts blissful state of thoughtlessness was actually happening with them which was absolute joy and peace giving. As soon as prayer was being offered to Shri Mataji with the song 'Vineti Suniye' at the Sahastrar Chakra the whole Hall started chanting spontaneously and all the yogis were united with Shri Mataji at the Sahastrar in reality. The beautiful expression of Niranand which we can only feel by the blessing of Shri Mataji was felt by everyone present there, faces were shining and hearts were rejoicing with Divine love. It was Heaven in the presence of Goddess. she had sung before in Mother's presence in the praise of Mother Maria- the Mahalaxmi. Finally around 7.30 PM the workshop came to an end with offering of Aarti and gratitude to Holy Mother for such a wonderful most awesome experience to all the yogis present there. Over the past few months ever since SHRI MATAJI left her Sakaar form, the flow of vibrations has been phenomenal. SHE has been watching over us and taking care of us through some of the incidents which saw Sahajayogis drifting away from each other. We longed for the return of innocence and longed to see Sahajayogis once again have nothing but love for each other like how it was when SHE was with us in her Sakaar form. We, the Navi Mumbai committee, felt the need to conduct a meditation festival where it would be just meditation and SHRI MATAJI's tapes with Sahaja music being played in between. So when the offer came to arrange such a "Festival of Meditation" we immediately decided to go ahead with it. The days to the run up of the workshop, were very hectic with the preparations.On the day of the workshop after checking all the arrangements and we settled down for meditation, it was like being taken on a journey that was both beautiful and transformational. The entire day was simply bliss. As we started out on various chakras we could feel the vibrations working out things for us with the same love SHRI MATAJI in her Sakaar form would give to all of us. There was pure joy just flowing out. It had been quite sometime since I had experienced such carefree state of meditation. It was as if we were all completely surrendered at the feet of SHRI MATAJI !! Some of us had forgotten the joy of collectivity, we could once again experience what to me was like a homecoming. "Yes!! We can experience thoughtless awareness and maintain our Nirvicharita". I urge all Sahajayogis to attend this workshop. It will bring back the love between Sahajayogis. I thank Shri Mataji to give an opportunity to be in Saniddhya and Samipya with the divine through such meditation. It was a great experience of being at the lotus feet of Shri Mataji all the time, which automatically makes us remain in the state of 'Nirvicharita' and easily takes us away from all the negativity by saying the only mantra 'Shri Mataji'. It was an extra-ordinary seminar for me, I think for everyone who were present that day. Because that seminar made us feel that we are absolutely at the lotus feet of Shri Mataji for the entire day. Generally, a common definition of seminar is to just to listen to the speakers and forget the things after few days. In sahaja yoga also, this trend has been following since last few years. But this seminar was nothing but a brush up to all those very simple but important things for sahajayogis. As like, just humbly saying the Mahamantra 'Shri Mataji" instead of mechanically clearing the chakras. Mother is the only who is giving us the flow of vibrations and She is the only one who makes us absorb those divine vibrations. I pray at the lotus feet of Shri Mataji that all sahajayogis should get to attend such meditation workshops. First of all many many thanks to Shri Mataji that she brought all yogi brothers and sisters to us in Navi Mumbai for spreading rather reminding us a very simpler and joyous experience of meditation. Fortunately I got opportunity to attend this Meditation Workshop for second time and every time I felt like stepping ahead towards the Lotus Feet of Mother. Each and every aspect of Meditation was very helpful and joyous and giving loads of cool breeze. And the very much effective for me was the clips of Shri Mataji's speeches which were played according to the collectivity's spiritual weaknesses. Another effective aspect was exchanging of vibrations. I thank God Almighty that I got a golden chance to sit directly in front of Shri Mataji and grasp loads of vibrations from all the collectivity which was present at the venue. By the Grace of our Divine Mother Param Pujya “ SHRI MATAJI”, once again it was a unique and wonder full experience of mothers blessings ,love and compassion showering over the sahaj yogis in the form of blissful state of” Nirvicharita” together with beautiful flow of vibrations. This all is achieved with the simple and humble prayers and with complete surrender at the Lotus Feet of our Holy Mother “Shri Mataji” and this also happened effortlessly. Everyone who attended also experienced the miracle of the humble pray of two word Maha mantra “SHRI MATAJI”. 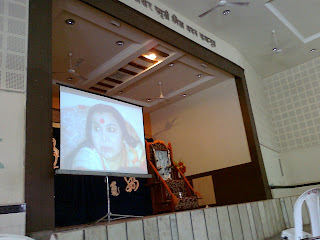 On 18th September , 2011, attended the workshop (Dhyan Mahotsava) of Sahaj Yoga meditation at Kopar Khairane, Navi Mumbai. The venue hall was so large and beautiful and was fully occupied by the sahaj yogi brothers and sisters of Navi Mumbai. We were late to reach the venue by about an hour hence the workshop had already begun. As soon as we entered the hall , we felt the atmosphere inside was so “chaitanyamayee” that it was giving feel like the sakshat puja is going to be performed. Later one sahaj yogini sister in the lunch break was expressing her feelings that in the morning when the “Dindi” of Shri Mataji reached the venue hall, she and others felt like sakshat “Shri Mataji” has arrived in person. From the beginning itself, it started the continuous flow of vibrations, gradually increasing and at the same time process of very effective clearing of the Chakra s took place spontaneously .It was an unique experience that in a very short time the flow of vibrations started increasing steadily and every one started enjoying the Mothers Blessings in the form of blissfull state of “Nirvicharita” achieved absolutely without any efforts. Every one was experiencing the joy of surrendering at the Lotus Feet of our Divine Mother “Shri Mataji”. The periodical playing of audio clips of selected excerpts from the speeches of “Shri Mataji” and playing of instrumental music during the thoughtless state of mind has taken every one to a further enhanced blissfull state. And the Musician brothers and sisters with the sweet Bhajans and Alaps sung in praise of our Divine Mother have further taken the whole collectivity to a very high blissful state of thoughtless awareness. One of some remarkable instances noticed about how the collectivity enjoyed this workshop, I would like to mention here. That, around 5.45 pm , after a long sitting in post lunch session , the organizer sahaj yogi brother stood up and asked the collectivity as to whether shall have a tea break? Immediately, the other senior sahaj yogi brother suggested him to ask whether “Chai chahiye ya Amrit ? (Tea or Amrit ?) This question itself has refreshed the whole collectivity and the collectivity with smile has opted for the “AMRIT”. Immediately the musician group provided the whole collectivity with a dose of sweet” Bhajnamrit “ added with beautiful flow of vibrations blessed by mother and in a very short time the whole collectivity was in a very blissful state of mind at the” lotus feet of our Divine Mother”. Overall, it was a wonderful experience of Mothers blessings and love to every one who was present and same has been reflected through their expressions expressed on mike at the end Moreover ,the glowing and happy faces of sahaj yogi brothers and sisters were enough to tell about . The workshop was organized so well, open heartedly and with love that it was felt to be a truly Sahaj Yoga family programme blessed by our Divine Mother H.H.Shri Mataji. We all bow down at the Lotus Feet of our HOLY MOTHER for giving us this wonderfull opportunity to feel her Eternal Love and Bliss of thoughtless state of mind. We also humbly pray our Divine Mother that this wonderful experience of Her Love through this unique workshop may happen every where and experienced by all the Sahaj Yogi brothers and sisters across the globe. Koti, koti Naman at the lotus feet of our Holy Mother “ Shree Mataji “ . THANK YOU “SHRI MATAJI” ,the brothers & sisters of the team and the organizers and the collectivity of Navi Mumbai. Jai Shri Mataji. I HAVE ALREADY WRITTEN ABOUT THE MEDITATION WORKSHOP CONDUCTED BY ,”NIRMAL SARITA” AT NAGPUR.THE ONE DAY COLLECTIVE MEDITATION AT NAVI MUMBAI ON 18TH SEPT.CONFIRMED MY BELIEF THAT THIS NIRMAL SARITA WILL SOON GROW INTO AN OCEAN. IN NAVI MUMBAI AS THE COLLECTIVE MEDITATION PROGRESSED,THE COLLECTIVITY WAS COMPLETELY DRENCHED WITH THE VIBRATIONS.I THANK SHRI MATAJI FROM THE BOTTOM OF MY HEART FOR GIVING ME AN OPPORTUNITY TO BECOME A MEMBER OF THE FAMILY,”NIRMAL SARITA”,WHO ARE DESERVEDLY BLESSED BY THE ADISHAKTI. 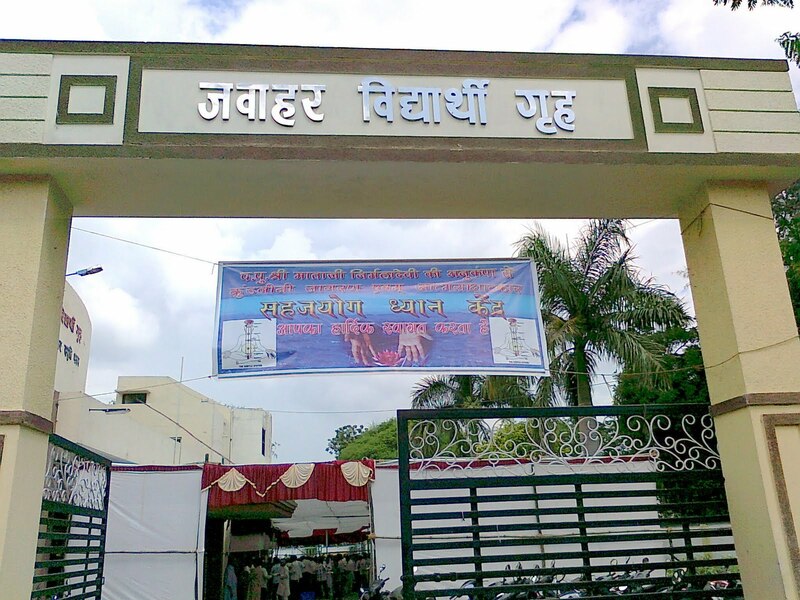 WAITING ANXIOUSLY FOR THE SAME DIVINE TREAT AT WARDHA ON 8TH AND 9TH OCTOBER. I HAVE MADE A PROMISE TO MYSELF THAT,WHENEVER I WILL GET AN OPPORTUNITY TO ORGANISE A SIMILAR MEDITATION WORKSHOP IN ANY PART OF THE WORLD I WILL FEEL VOUCHSAFED.AS THIS COLLECTIVE MEDITATION GIVES ME THE JOY OF A “SAKAR POOJA”. 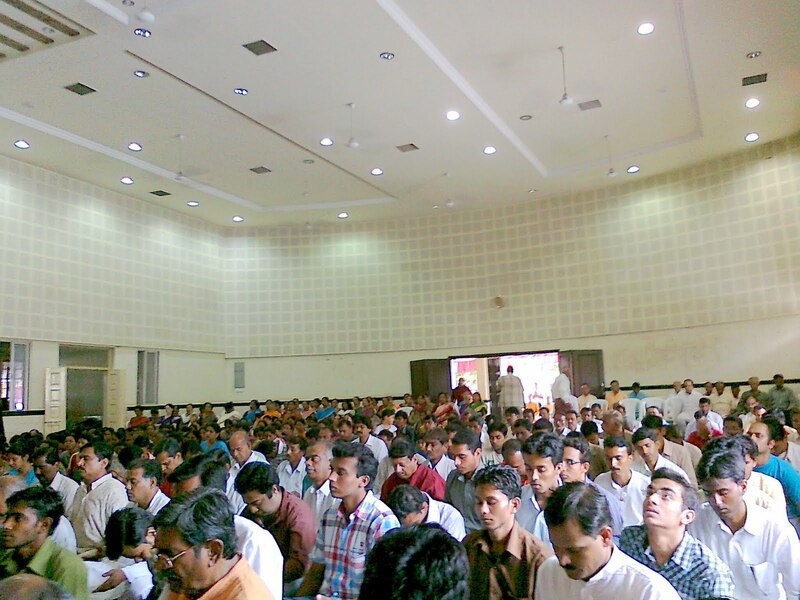 Dear all, our experience in navi mumbai worshop was Tremendous as v enjoyed the Meditation program in an unique way. we bowed down to Shri Mataji's Alter, already the Param chaitanya was flowing and the flow was such that we could feel ourselves in Bandhan. was already Done before it started. V cud experience lot of clearance taking place inside us and more & more knowledge of the Divine getting into us.V were gaining more oneness and surrendering to ShriMataji's Lotus Feet happening within us.Level of Surrendering & Confidence is Ascending in a huge capacity. When we were interacting with other Sahajayogies, cud feel the Joy in each and every one's face bubbling out. Shri Mataji's Photograph and prayed to get relieved and cud really feel that v had passed a small test or exam put to us during our day to day Ascent. Thank u Shri Mataji with Koti Koti Pranams for blessing and protecting us from all the Irrelevant,evil,negative forces instead keeping us always in the Positive Side. The Mumbai workshop is really wonderful. In the beginning the workshop was started with a great procession by taking Shri Mataji Padukas in a palki like traditional way by welcome aarathi. The moment the procession was entered inside the meditation hall, My Kundalini came to Sahasrar and gave the eternal bliss. The meditation was started with collective bhajans. Cleansing of nadi’s and chakras everything was done only with a great mantra “SHRI MATAJI…”.Placing the right hand on any chakra with left hand towards Shri Mother and praying Shri Mataji by feeling her in out heart with love, bhakti and Surrender, the vibrations started coming from Mother’s photo entering into our left hand and passing through right hand to the chakra where ever we placed and saying the mantra SHRI MATAJI………… SHRI MATAJI………. SHRI MATAJI……….. while saying I could feel like the chakra place, finger tip are getting slowly cool without any effort. We hear that whenever we think of shri mataji, she will be present with all her powers. With this workshop, I really experienced in a practical way. I could feel Shri Mataji in every aspect of meditation. I have learnt many things in this workshop like surrendering our problems, daily effortless meditation, etc. I really thank Shri Mataji for giving me the opportunity to attend this worshop and I pray to Mother that all sahaja yogi’s must get this opportunity to attend this workshop atleast once. .On behalf of Uran collectivity, we thank you very much for the " Sahaja Work Shop " conducted on 18/09/2011. 1. We have all experienced and enjoyed the bliss and cool devine vibrations from our holy mother through out the work shop. 2. All most every one felt and experienced the " Cleansing " process / prayer / technic very very simple, just by saying " Shri Mataji ". 3. " NIRVICHAR " state achied in short time. to sit back (down) and to continue the session....either way........ just to get releif from the legs or back strain due to continuesly sitting for more time. * Every Sahaja Yogi and Yogini enjoys the weekly centre activities, seminar, work shop and pujas. * Many of the sahaji's are not able to cope up with their daily routine activities with non SY. * Angry levels are not reduced. * Most of the yoginis spouse not intrested in Sahaja Yoga due to which yoginis are unable to continue their SY practice. Once again we thank you very much for the beutiful work shop. On Behalf of Uran Collectivity. Yogis who attended the seminar immensely understood the divine grace internally and externally.Our beloved Mother fulfilled the desire of each one of us for which we all were praying since long. We all the Sahajayogis are thankful for such wholehearted support and guidance of all the Sahajayogis who specially joined us from different part of India. This is in regards to the program held on 18th Sep. 2011. 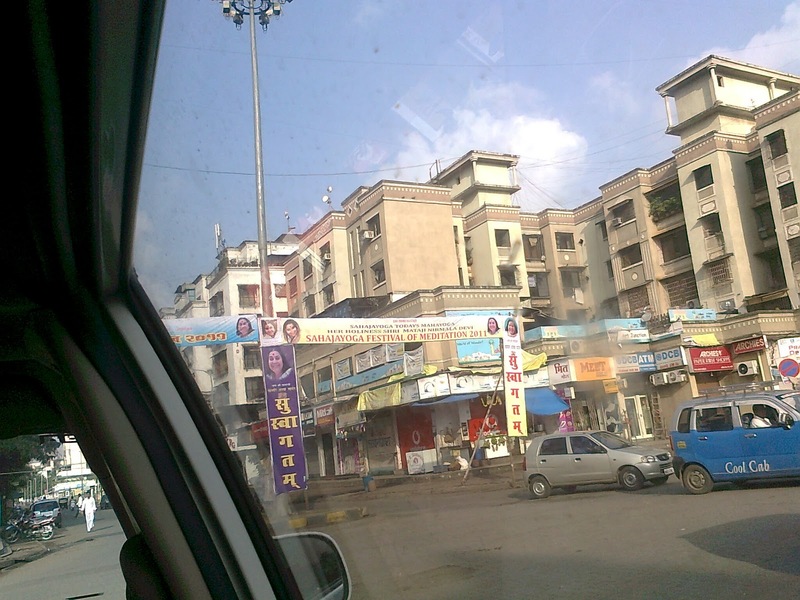 It was one of its kind in Navi Mumbai. It's been a pleasure working with you, the opportunities that you have given me cannot be described in words. In future i would be obliged to do anything for Sahajayoga and Shree Mataji, as its been my interest. I am also obliged to Shree Mataji, for giving me the will power to do all that i have done and will do in the future. Thanks once again. I attended seminar and I liked it very much and we arrange this type of programs every 6 month. आम्हाला खूप आनंद झाला .हे आमच्यासाठी खूप नवीन आणि आनंददायी होतं.पूर्ण दिवस खूपच आनंदात गेला सहजयोगात येणे जसे योगायोग आहे तसे हा दिवस सुद्धा आमच्यासाठी एक योगायोगच होता. "परमपूज्य श्री माताजी तुमचे खूप खूप आभार आहेत " ज्या सहजयोगी बंधू आणि भगिनींनी या साठी खूप मेहनत घेतली त्या सर्वाचे शिरकांडे परिवाराकडून हार्दिक आभिनंदन . ज्या सहजयोगी ग्रुपने ध्यान घेतले त्या ग्रुपला खूप खूप ..... धन्यवाद .श्री माताजी तुमचे हे उपकार आम्ही कधीच विसरू शकत नाही.तरी पण काही चुकल्यास क्षमा असावी .आपल्या चरणी कोटी कोटी शतशः प्रणाम . हा सेमिनार परत महाराष्ट्रात कोठेही झाला तर कृपा करून आम्हाला कळवा . कारण आशा ध्यानधारणेची आम्हाला खूप आवशक्यता आहे .खर तर रोजच आसे ध्यान व्हावे आशी परम पूज्य श्री माताजीच्या चरणी प्रार्थना आहे . श्री माताजी आम्हा जगातील सर्व सहज्योग्याना आशी सद सद विवेक बुद्धी द्या कि आम्ही सदैव आपल्या कमल चरणावर लीन राहू .व आम्हाला मार्ग दर्शन करण्यासाठी आसे ध्यान घेणारे सहजयोगी लाभोत . By the blessing of Shri Mataji, seminar was very well planned and organised. The whole atmosphere at hall was so full of joy that every one felt the Vibrations flowing into them effortlessly. This was a unique experience for all brother and sister present. Let these seminars happen every where and let all Sahajayogis enjoy the divine love! I wish to share some of important points of above seminar. i feel all our chakra can open with this mantra. chakra & problem is highly important. also seminar was free for all. found extrmely good. our internal & external problems. OUR DIVINE MOTHER HAS HER OWN WAY OF DOING THE THINGS.MOST OF THE SAHAJAYOGEES THOUGHT THAT THE WISH OF CONVERTING THE WHOLE WORLD TO SAHAJA WOULD NOT BE FULFILLED AS OUR HOLY MOTHER TOOK THE SAMADHI.BUT THEY SEEM TO BE FORGETTING THAT THE POWER OF ADI SHAKTI WAS THERE,IS THERE AND WILL BE THERE AS IS EVIDENT FROM THE VIBRATIONS PREVAILING. A TEAM OF SAHAJA YOGEES WITH THE BLESSINGS OF SHRI MATAJI CONDUCTING THE WORKSHOPS AT THE VARIOUS CENTRES IN INDIA REGARDING THE VALUE OF SURRENDERING AND EXPERIENCING THE MOTHER'S LOVE WITHIN IS REALLY HEARTENING.I HAD A PRIVILEGE OF ATTENDING ONE SUCH AT TIRUPATI,WHERE I WAS TAKEN TO A VERY DIFFERENT LEVEL OF FEELING THE MOTER'S LOVE WHICH I NEVER EXPERIENCED BEFORE.THIS PROMPTED ME TO ORGANISE A SIMILAR WORKSHOP AT NAGPUR ON 27th AND 28th OF AUG.WE THE YOGEES OF NAGPUR ARE REALLY GRATEFUL AND INDEBTED TO OUR DIVINE MOTHER,THAT THROUGH THE ABOVE MENTIONED GROUP WE WERE REALLY TREATED AND TAKEN TO A DIFFERENT LEVEL OF AWARENESS. WE EXPERIANCED THE WONDERFUL EFFECT OF CHANTING THE GREAT MANTRA - SHREE MATAJI. 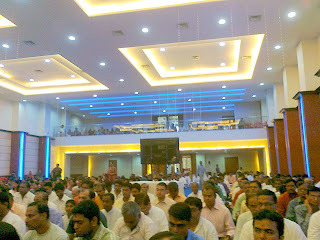 By the Grace of Param Pujya Shri Mataji , Nagpur collectivity organised a two day's meditation workshop for Nagpur region with the help of Sahaji Brothers from Delhi on 27th and 28th of August 2011. 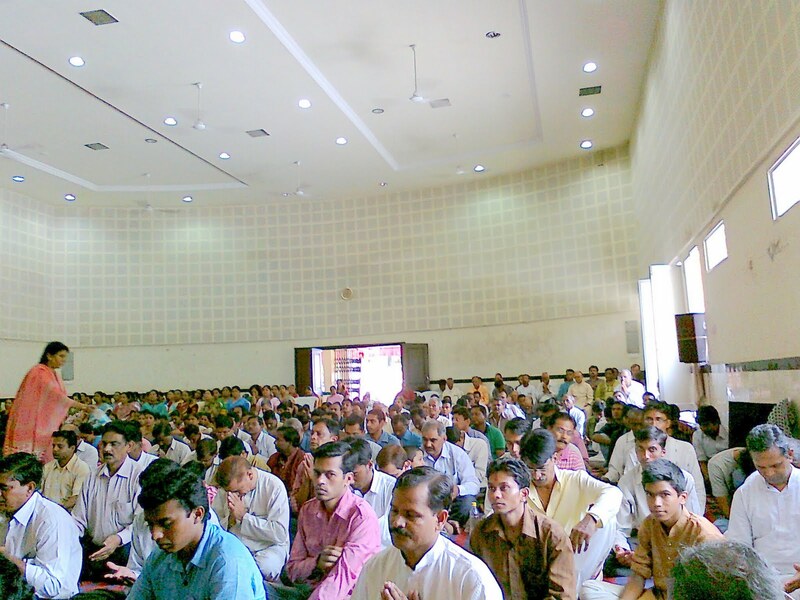 The workshop was attended by about 600 Sahaji brothers and sisters from Nagpur and adjoining districts of Vidharbha. There were almost no mantras during the seminar except for one Mahamantra - The Name of Shri Mataji. We prayed to Her, asked Her to help us, and could feel our attention rising to Sahastraracollectively. Next day we started in the morning, and could feel, that the previous day did not go in vain - people went to meditation almost immediately. In the meanwhile musicians were performing Pyar Bhare ye do Nirmal Nain,Guru Stuti, and other prayers. Overall it was very pleasant and marvelous experience and feeling of cool breeze with full of miracles and vibratory awareness. and those who have given such feeling and true meaning of Dhyan (Meditation). By the Grace of our Holy Mother Param Pujya “ SHRI MATAJI”, the Sahaj Yoga Nagpur centre collectivity had a wonderfull experience of “Param Chaitanya” during the two days workshop organis ed at Nagpur on 27th and 28th August 2011. 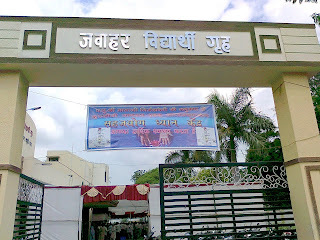 The workshop is so beautifully designed and conducted by the team of sahajyogi brothers and sisters who came from various cities of the country ,that from beginning itself every one experienced the Love and Blessings of Shri Mataji through continuously flowing beautiful vibrations and effortlessly attaining the state of thoughtless awareness. This all is achieved with the simple and humble prayers and with complete surrender at the Lotus Feet of our Holy Mother “Shri Mataji” and this also happened effortlessly. Everyone who attended also experienced the miracle of the humble pray of Maha mantra “SHRI MATAJI”. At the initial stage of session, very effective clearing of the Chakra s took place spontaneously and thereafter the flow of vibrations started increasing steadily and every one started enjoying the Mothers Blessings in the form of blissfull state of “Nirvicharita” achieved absolutely without any efforts. The periodical playing of audio clips of selected excerpts from the speeches of “Shri Mataji” and playing instrumental music during the thoughtless state of mind has taken every one to a further enhanced blissfull state. So also about the periodical classical Bhajans sung in the praise of the Holy Mother Adi-shakti accompanied by the deep Alaps by our sahajyogini sister and brothers have taken one and all to feel the Mothers Love, Compassion and Blessings . We all bow down at the Lotus Feet of our HOLY MOTHER for giving us this wonderfull opportunity to feel her Eternal Love and Bliss of thoughtless state of mind. We humbly pray our Holy Mother that this wonderfull experience of Her Love through this unique workshop may happen every where and experienced by all the Sahaj Yogi brothers and sisters. Koti, koti Naman at the lotus feet of our Holy Mother “ Shree Mataji “ . THANK YOU “SHRIMATAJI” and brothers & sisters of the team. 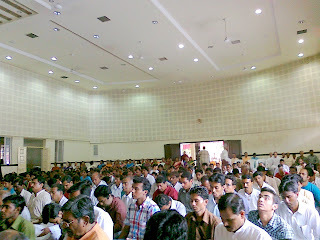 I am happy to note that the work- shop held at Nagpur on 27th & 28th August 2011 was really a unique one. The first and important feature of the work shop was to give an experience of the joy of total surrendering to “ H.H.SHRI MATAJI NIRMALADEVI” . All of us had this experience during the workshop. In fact all of us had this experience prior to this workshop also . But the easy method of total surrendering which was explained in this workshop was really amazing . Each one of us can practice this method during individual meditation and collective meditation and can enjoy the Divine Vibrations of H.H.SHRI MATAJI NIRMALA DEVI. Second feature of the workshop was how to gain NIRVICHARITA. This was also explained with experience. It was simply amazing to enjoy the whole collectivity in thoughtless-awareness. Sahaj Yoga is a living process and we are always endulged with some problem or the other. In order to overcome these problems , we have to pray and surrender . This truth was also experienced by us. I do not hesitate to state that simple tips like coining our own prayer and surrendering our problems at the Lotus Feet of Shri Mataji are so effective that we are adopting them in our day to day life. Even the joy of Sahaj yoga techniques like exchanging vibrations and giving vibrations was experienced by us. The clips of H.H.SHRI MATAJI”S speeches ,mingled with sweet Bhajans and instrumental music made the workshop lively and interesting , informative and effective . I congratulate and thank yogis team for conducting this workshop at Nagpur. It’s an unique experience We are fortunate enough with the Divine Mother’s blessings to be part of huge collectivity around 1200 yogis and yoginis joined together from Chandigarh, Delhi, Pune, Mumbai, Chennai, Hyderabad and all corners of Maharashtra state for the 2 day seminar at Nagpur from 27th to 28th Sept, 2011. Amidst heavy rains continuously for about 4-5 days prior to the Shri Ganesh Puja, the seminar went off smoothly with Divine Mother’s grace and new dimension from ‘Nirmal Sarita Team’ who have totally taken away the entire collectivity awakening every part of the body/chakra and the lights get lit up in the hearts. As soon as we have got into huge wealth of Thoughtless Awareness, submerging or body, mind and emotions, a big Mantra (also can say Beez-Mantra) ‘Shri Mataji’ is followed for every chakra clearance. Such a Power of Love and vibrations followed through our hands and start receiving joy from our spirit, is really a surprise with the blessings from our Mother. The internal ascent is felt at a very high level, with out any effort. If our attention is enlightened by the power of spirit, which has an ocean of love, peace, joy and beauty, it would be really wonderful. We have to grow into it as we are going to reflect Sahaja Yoga and the reflector should be very clean. If the reflecting power of the reflector is fully awakened, then there will be no difficulty before us. With our Mother’s full security and protection, we have to understand ourselves and evaluate ourself to grow deeper and deeper. A great responsibility has been showered on our Nirmal Sarita Team by our Divine Mother for building up a pure-hearted collectivity in which we could place our faith and remain established in it. These experiences, it is felt, are needed to be shared, as to how much have we achieved and how much Divine joy we enjoyed, in the short period of 2 day seminar and if entire Sahaj family become in the state of bliss, it will be a big difference – as our Mother cherished her desire. feel the love of all pervading MOTHER just by uttering her name. virtually into the seventh heaven.